If you’re struggling to manage your mailbox sizes, or just need to keep email for long periods for compliance reasons, you may well have found yourself looking around for an archiving solution of some kind. There are plenty out there, with many sharing some similarities, however it’s the technical approach of the various products that’s a good method for distinguishing them. Some of the vendors you’ll come across will employ the use of a technology known as ‘stubbing’. As MailStore Server doesn’t, in this post I’ll take a brief look at what it is, and why it’s German developers have decided against stubbing and instead chosen an alternative route. Most archiving solutions have a common aim, and that’s to reduce the load on your mail server without restricting the email your users have access to. 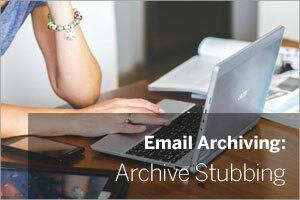 Stubbing is a method of achieving this by making a copy of the contents of a user’s mailbox and moving it to an external archive location. A much smaller version of that message, or a ‘stub’, is left behind, which acts as a file pointer back to the original email. When a user clicks the stub, a copy of the message is then retrieved form the archive and displayed in full for the user, as if it was there in the mailbox. The theory behind this is that a stubbed email has a much lower storage requirement than as it’s been reduced just to the header information rather than the full message. So if your users don’t have to change the way they’re working, you’re saving space and your server load is reduced, surely everyone’s a winner right? Well, not exactly. There’s no doubt that stubbing reduces the storage space used by your mail platform in the short term, however it could be argued this is a false economy. Storage is generally less expensive than it’s every been, but more importantly, it’s not actually the amount of mail that has the biggest affect on performance, it’s the number of items in your mailbox. Educating large numbers of users over even a small change can require some thinking ahead, so it’s unsurprising that key to the appeal of stubbing is the perception that to the user the new archiving solution will be almost transparent as far as they’re concerned. It’s not until a user performs a search that it’s evident this isn’t strictly true, because when you use stubbing, you’re actually moving the bulk of the message you’d usually use to search on. Because of this, you’re limiting Outlook’s search ability and increasing the likelihood you’ll need to perform a search on the archived data outside of Outlook to locate a message. The advantage of transparency isn’t quite as clear cut as it seems initially. Another misconception surrounding stubbing is that it’s both simple to implement and to maintain. In terms of getting up and running, to implement stubbing requires you to make some significant changes to your Exchange server, which can be time consuming and also quite risky if you’re working with a live environment. In addition, by installing third party stubbing components that are so tightly integrated with Exchange, every time there’s a new update or patch from Microsoft, you’ll need to verify whether the archival software will support it. This additional maintenance overhead may delay the updating of critical security components. How does MailStore Server differ? MailStore doesn’t use stub objects or place holders, however it does reduce server workload significantly and still enables users unrestricted access to all email. All email is fully searchable without ever needing to leave Outlook (although there are options for mobile devices etc.). Performing a single search for a keyword will search across headers, body, subject and even common attachment types such as Word, Excel and Powerpoint (more on the user experience). In addition, because MailStore is automating the process of email deletion beyond a certain age it genuinely reduces load by reducing the number of items and the storage requirement. MailStore can be tested and run alongside an Exchange Server without any impact to the live environment. When you are ready to implement fully, there’s no need to make any changes to your server. Connect to your live Exchange environment whether it’s hosted or on-premise using the free 30-day trial of MailStore Server available from our web site (includes free technical support).